Digital time switch used to switch plant on and off, or for the control of setback periods at night or at weekends. The microprocessor automatically stores the programmed times in chronological order. 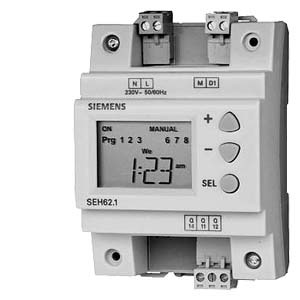 A switch with momentary contact closure across M-D1 activates the countdown timer. The power supply is buffered by a memory backup capacitor. In the event of a power failure, the time switch will continue to run, with the program retained, for 72 hours. However, the relay will assume (or remain in) the normal position.